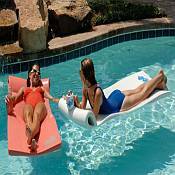 The Kool Float has a soft, half-circle head rest coated with an easy-to-clean glossy, smooth vinyl. Kool Float graphics and a matching Kool Kan are included with each float. The Kool Float is approximately 70inLx26inWx1-3/4in Thick. Kool Float graphics and a matching Kool Kan are included with each float. The Kool Float is approximately 70inLx26inWx1-3/4in Thick. Available in: White, Yellow,Bahama Blue, Keylime Green and Caribbean Coral.